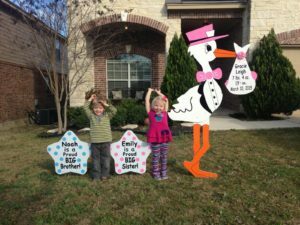 Please contact us to place your reservation at (301) 606-3091 to rent a stork sign to welcome home your new baby or grandchild. Call us at (301) 606-3091 for more information or to book your stork rental today! Please visit us on FB to see our most current rentals. Please follow us on Pinterest . We’re also on Google Plus too!